Kris Letang was a big fan of Mario Lemieux and the Pittsburgh Penguins while growing up. Kris Letang is living out every young Montreal native's dream -- he's playing for his favorite NHL team. Except, in Letang's case, it's not the Canadiens. "I was a Pittsburgh fan because of Mario Lemieux. He was my idol," the 21-year-old rookie defenseman said. "It was pretty exciting when I heard my name called by Pittsburgh." 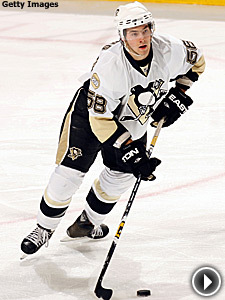 That came in the third round of the 2005 Entry Draft in Ottawa, two rounds after the Penguins drafted Sidney Crosby. Three years later, the two are teammates as the Penguins pursue their first Atlantic Division title since 1997-98 -- and one of the things Letang enjoys most about his first season with the Penguins is being able to watch Crosby up close. "What he can do on the ice is unbelievable," the rookie defenseman said. "He's the greatest I've ever seen playing. He's going to be the best player in the world for 10, maybe 15 years. You just have to learn from him and watch him. Every day in practice you have to work hard and follow him. He's a good example for us. We just have to follow him. We can learn from him." Like most kids who grow up in Montreal, Letang was a big hockey fan, just not a devotee of the home team. "I was never really a Canadiens fan, though I watched all the games because I loved hockey," he said. "Mario Lemieux was my favorite player when I was young. It was a thrill to get to meet him. He comes in the locker room sometimes. It's always great to see him." Letang's road to the NHL has hit a few speed bumps along the way. It looked like he might be here to stay in the fall of 2006. He made the team and appeared in seven games, scoring his first two NHL goals. But the Penguins felt he wasn't ready to be a full-time NHL player and returned him to his junior team, Val D'Or in the Quebec League. "I was there and I was kind of playing good," he said of his brief time with the Penguins during his first stint. "But to get some confidence, sometimes you have to take a step back to take two steps forward." Instead of pouting, Letang put up another solid season, finishing with 14 goals and 52 points in 40 games -- with a break around the holidays to earn a second gold medal with Team Canada at the World Junior Championships. He added 12 goals and 31 points in 19 playoff games. Despite his solid showing in juniors, Letang wound up starting this season with the Wilkes-Barre/Scranton Penguins of the AHL. He had a goal and seven points in 10 games before being recalled in early November -- this time, it appears, for good. "They sent me down to work on my defense," he said of his brief stint with the Baby Pens. "That's always been the question mark with me. I'm an offensive guy, and they don't want me to play offense all the time. They want me to be responsible in my own zone and play well defensively." Letang has taken a regular turn since his return, averaging more than 18 minutes of ice time per game. Though his defensive play has been better than expected, he hasn't contributed as much offensively as the Penguins thought he would. But three of his five goals have been game-winners. What Penguins fans remember most about Letang is his back-to-back shootout-winning goals during Pittsburgh's trip through Western Canada in early December. Letang beat Calgary's Miikka Kiprusoff to win a shootout on Dec. 6, and followed two nights later by scoring a second straight shootout winner by beating Vancouver's Roberto Luongo. Letang admitted he was a little surprised when Penguins coach Michel Therrien called on him to take his first NHL shootout attempt after Kiprusoff had stopped Crosby and Evgeni Malkin. "A little bit, yes," he said. "But he (Therrien) knows I don't get nervous in those kind of things. I can shoot the puck. He just sent me out there -- it was a little surprise." The second goal was even more enjoyable because he beat a fellow Montreal native. "That was good," Letang said. "I know Roberto a little bit, he's also from Montreal. I think he's the best goalie in the League right now, and it was nice to beat him." Letang got a third shootout winner against Atlanta on March 2 and is among the League's top shootout performers -- he's 5-for-8 with three game-winners. No other NHL defenseman has more than two shootout goals this season. "The kid has got no fear," Therrien said. "We practice the shootout every week, and I like his skill." Though Letang's play in his own zone has more than met the Penguins' expectations and his performance in shootouts has been spectacular, the Pens are still waiting for him to show more of the offensive skill that he exhibited in juniors. His coaches are actually pushing him to take more shots. "I have to shoot more," Letang said, though he notes that the presence of players like Crosby, Malkin and Petr Sykora make him more inclined to get the puck to a forward, rather than carry it himself. "Sometimes, you don't want to make a mistake."